For our youngest athletes (pre-K to 3rd grade) we offer a program for learning how to play basketball called Junior Basketball Association (JBA). 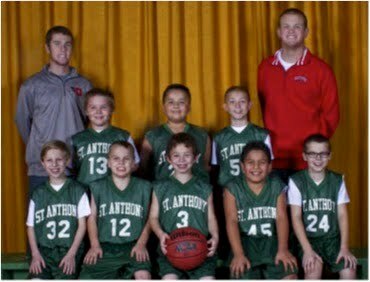 JBA runs from late November to February, and games are played on Saturdays in the St. Anthony gym. The youngest group plays in the afternoon and the older kids play Saturday morning. Score is kept although rules are liberally enforced. Kids are encouraged to play at their own level as part of a team. At the end of the season there is a single elimination tournament. this program is for our youngest athletes (pre-K to 3rd grade). JVA also runs from November to February, and all matches are on Saturdays in the St. Anthony gym at noon. Soccer signups occur in May of the preceding school year as the season goes from August (before school starts) to October. Teams form over the summer and practices start the first week of August. 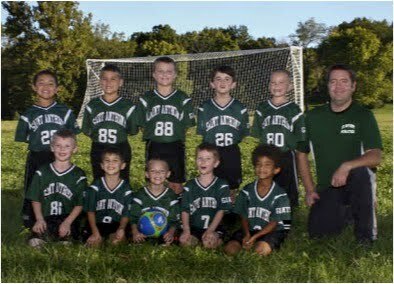 St. Anthony plays soccer within the SAY organization (Kittyhawk SAY) for grades up to the 4th grade. SAY leagues are organized into the following divisions by grade: Pre-SAY (pre-K and Kindergarten), Passers (grade 1-2), and Wings (grade 3-4). Older grades (5-8) play soccer in the CYO leagues (CYO home).